Disclaimer - they selected the accompanying photo! Link to the article below. The study of this sutra on a bright, sunny February morning in India was one of the (many) highlights of Jivamukti Yoga Teacher Training. 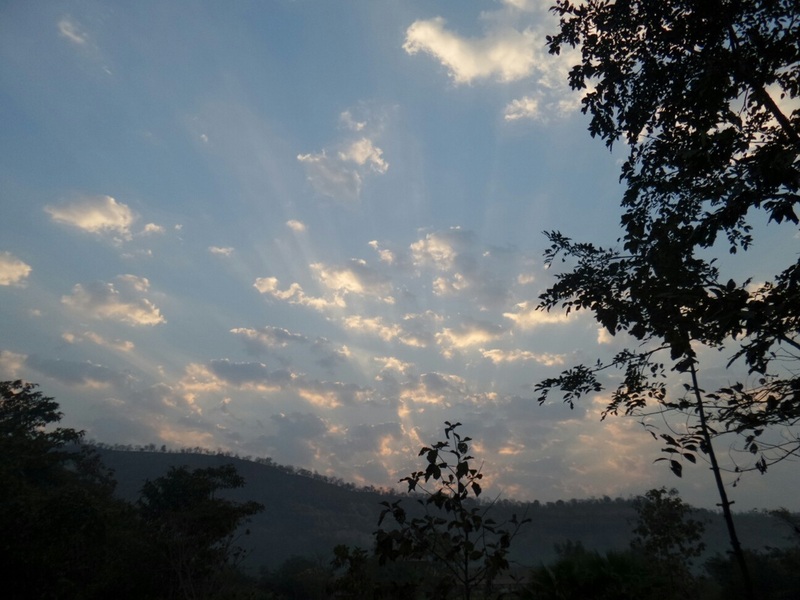 After meditation every morning, our teachers Jules Febre and Lady Ruth introduced a short text from scripture, be it Patanjali's Yoga Sutras, the Bhagavad Gita or another source. We took the time to translate, break down, ruminate over and chant the texts. As explained by our teachers, this particular sutra explains how we can preserve our serenity of mind. These are the four 'keys' presented by Patanjali. Within these four keys there is always a way of responding to a situation that is both responsible and appropriate. The last part - 'be indifferent toward the wicked' - was one that Jules ji and Lady Ruth took time to explain in depth. Too often, it's easy to define people by their deeds, or label people in certain ways due to their actions. They cautioned us against this, and urged us to resist responding to bad deeds with bad deeds. This would in fact keep those cycles, that energy, continuing. As explained further by Shyam Ranganathan, "Patanjali does think that the proper attitude towards evil is not wrath or anger, but equanimity." He also notes that in Patanjali's view, no person is truly evil, and "showing compassion to those who are unyogic in their lifestyle and behavior is an opportunity for us to practice yoga." Being happy for those who are happy and delighted for those who are virtuous is not as easy as it seems, is it? Oftentimes, another person's happiness or success can cloud our own mood, as jealousy, ever so slight or not, seeps into our thoughts. "Wow, she got that promotion already? But she's 5 years younger than me!" "He's obviously doing well only because his parents helped him get to where he is today." How do such thoughts help us, or others? They don't, really. важно как мы реагируем на это." What's important is how we react to it. And there you have it. We can't always control what comes our way in life, but we can chose how we react to it. This is what's crucial to our own state of mind, for our own wellbeing. And of course, our own wellbeing has a ripple effect on the happiness of those around us. Patanjali's four timeless keys presented in this sutra serve as guidelines. I plan to remind myself of these keys as often as possible, building this sutra into my morning routine. I hope for the humility to apply it with grace to situations that are uncomfortable and difficult, and with ease to those situations that call for happiness and joy. May this sutra serve as a tool in daily life for you as well! This weekend was full of yoga- related activities in Almaty. Yoga is offered throughout the summer at several of the parks in town on both Saturday and Sunday mornings - what a wonderful contribution by Almaty's yoga studios to urban health! Instead of yoga in the park on Saturday, I decided to go to Gayatri yoga and attend a master class offered by Elena. I have gone to her classes on and off over the past year and we have both studied under Daulet and Muhiyatbek. Lena's amazing - she offers very physically and mentally demanding yoga classes with lots of encouragement and plenty of hands-on adjustments. I thought a master class with her would be a great way to start the weekend. The class lasted for three full hours! We started with a discussion on unity in the mind and body, and whether or not the mind truly manages the body. Not always, as much as we think it might. The theme of the class was balance and unity, and this is what we were going to explore throughout. Lena, as she often does, reminded us to focus on the present. She asked me at one moment while doing yogic breathing what I was thinking about. I mentioned I was thinking about a project for work. 'You can leave that for work time,' she said with a smile. Our class flowed from discussion to yoga asana practice. The practice included several asanas that I've never done before, all with the goal of preparing our bodies and minds for balancing postures. After two quite intense hours, we built up to bakasana and several other balancing poses. By that point, I was happy I'd made it through the class holding poses for longer than usual, and was quite ready for savasana. But before final relaxation, we did a chakra-focused meditation for 15 minutes. In yoga, the breath connects the mind and body. Coming back to your breath reminds you to stay focused in the present. We try to make yoga a graceful moving meditation. It sometimes works, quite often doesn't...and I'm constantly humbled by the amount of progress I still have to go in practicing. However, spending three hours at a master class on a Saturday experiencing the full spectrum of a yoga practice - discussion, asana, meditation, chanting, pranayama - was a great way to be in the here and now and experience the mind and body connection for even a few fleeting moments. Thank you Lena and thank you Gayatri! 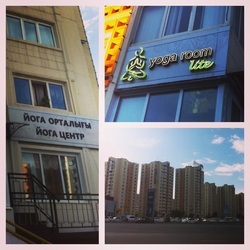 Looking for yoga in Astana, Kazakhstan? We found yoga room lite! At the end of a 48 hour trip to Astana, I was walking down Prospekt Respubliki near the Ramstore and 'yoga room lite' caught my eye. I walked in and asked if they had any classes on a Thursday evening. Luckily, the very friendly woman at the counter said there was an ashtanga vinyassa class starting in an hour! I quickly went to my hotel, grabbed some shorts and a tshirt, and returned. 1. 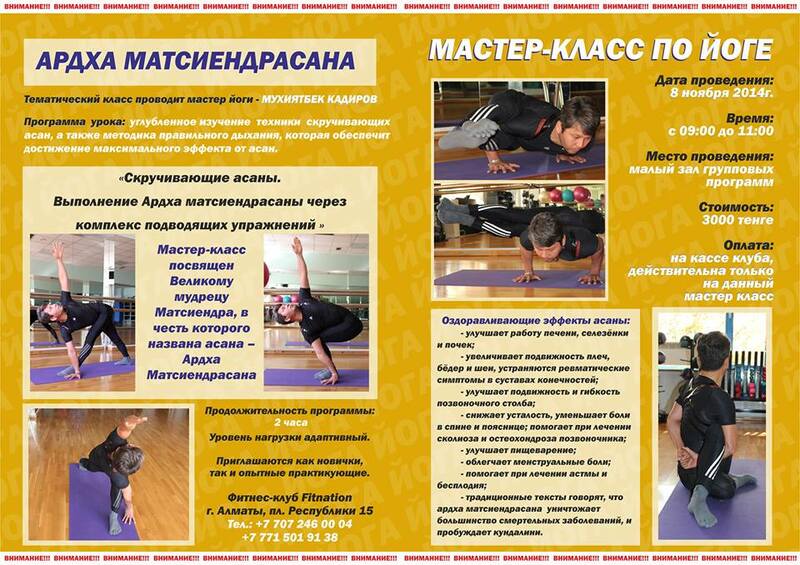 Gayatry Yoga Centers (http://yoga-center.kz) Come ready to chant, smile, stretch and sweat. Both downtown locations are exceptional, with the 7th-floor studio on Furmanova featuring stunning sunset views of the city and steppe beyond. The Shevchenko studio has plenty of parking to make a 6:30 p.m. class after work, and two beautiful studios. If you get there early, lounge on a sofa in the comfy reception area and pick up one of the latest yoga journals. A seasoned team of yoga instructors lead classes in a variety of styles of yoga. The center also regularly offers weekend seminars, retreats, and even vegetarian cooking classes. 2. Golden Bridge Yoga (www.goldenbridge.kz) Golden Bridge, located in the futuristic looking NurlyTau office complex, holds its own to any studio in the world in terms of décor and ambiance. A large sitting area featuring ornate teak wood chairs, tables, and plenty of throw pillows is the perfect place to relax after class and enjoy a tea or sweets from the club’s vegetarian café. Two yoga studios, showers, a massage and changing rooms, and sweeping city views make this one of the must-sees for yoga enthusiasts visiting or living in Kazakhstan. Pricing is on the higher side, but you pay for the atmosphere and expertise. While kundalini is the signature style at Golden Bridge, the club also offers hatha, Iyengar, yoga for pregnancy, and women’s yoga. Public transport is tricky, so best to go by taxi or walk there. You can’t miss the building. 3. YogaDom (http://www.yogadom.kz): Popular among Almaty’s eco-conscious crowd, YogaDom has classes and levels for everyone: from therapeutic somatic classes to intensive advanced level asana courses, the studio also offers workshops including Thai massage and acroyoga. The top-floor apartment complex location on right off of centrally located ‘Old Square’ and class schedule ranging from early morning to late evening make the center a convenient choice to accommodate a wide range of schedules. Visitors are welcome to hang out before or after class in the carpeted lounge area right beyond the reception desk. 4. Sunrise Yoga Center (http://sunrise.com.kz): With two spotless yoga halls, a beauty salon and massage services, and a window opening to a view of nearby rose gardens, the studio lives up to its reputation for top-notch instruction and services. Instructors have 10+ years of experience teaching with an emphasis on alignment-based Iyengar and therapeutic styles of yoga; several can use English in their lessons. The studio’s convenient downtown location offers an extensive array of classes including hatha, Iyengar, prenatal, and yoga for kids. Almaty is situated at the base of the spectacular Tien-Shan mountain range, and provides a perfect setting to go to the mountains and practice yoga any time from spring to fall. The steppe that goes for hundred of kilometers up throughout the country is sprinkled with lakes , valleys and canyons, also providing stunningly rich settings for taking a day-long or overnight yoga retreat. Do you have a favorite studio or place to practice in Almaty, or other studios in Central Asia? Let us know about it - we'll be happy to share!